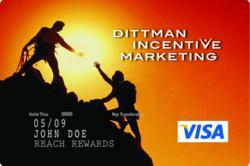 Dittman’s new domain, RewardCardsOnline.com., serves corporate rewards program buyers by offering custom corporate debit cards that can be used to motivate and reward employee excellence, business referrals, customer loyalty, and other business successes. Motivate your employees to go that extra mile for your organization by recognizing outstanding achievement with personalized Visa® Prepaid Debit Cards. Dittman Incentive Marketing, an award-winning leader in corporate incentive, recognition, and rewards programs, has announced the launch of the enhanced RewardCardsOnline.com website, an effective resource for corporate rewards program buyers. Corporate debit cards are increasing in popularity and are a smart solution as a spot reward for exceptional employee performance. Corporate debit cards are also a special way to say ‘Thank You’ to customers and employees, and an excellent way to reward referrals. RewardCardsOnline.com was created to meet this growing demand within the business community. “One of the most effective ways to motivate your employees to go that extra mile for your organization is to recognize outstanding achievement with personalized Visa® Prepaid Debit Cards,” says Dave Dittman, EVP Dittman Incentive Marketing. RewardCardsOnline.com can provide program administrators access to cards that are specific to their organization’s needs (Standard Debit Cards, Custom-designed Debit Cards, and select Gift Cards). Visa Debit Cards can have two lines of embossed customization including the recipient’s name printed on the card, as well as a congratulatory message from the company. “We’ve seen such high demand for debit cards and gift cards that we already have several major corporate clients using the system, and have enhanced the site to accommodate the needs of a growing list of new customers,” says Dittman. For more than 35 years, Dittman Incentive Marketing has been an award-winning leader in providing incentives, recognition and rewards programs to help companies realize immediate ROI in motivating sales people, employees, channel partners, customers, and consumers. Dittman’s signature products and services include: TotalPRO®(Performance Recognition Online) – an incentive, recognition and rewards online software (SaaS) solution, and Deluxe Group Incentive Travel. For more information, visit http://www.dittmanincentives.com.